Counterfeit Protection Policy - Saitech Inc.
Saitech Inc. has put multiple procedures in place to prevent counterfeit products from reaching our end customers. Through intensive training and participation in industry associations fighting counterfeiting, Saitech Inc has stayed at the forefront of anti-counterfeiting technology. Being a member of ERAI we have developed international counterfeit avoidance standards. We’ve taken our unique insight and experience and used it to develop unique processes to protect our customers. As per ISO 9001:2008 certification requirements, Saitech Inc. has a policy of continuous improvement of internal processes and procedures. These are critical in a world of information technology where every day, new products are getting and introduced, new technologies are being implemented, and product lifecycles are getting shorter. The assurance of product quality and processes is fundamental to all work undertaken by the Saitech Inc. team. The procedures established in our quality manual are practiced by all personnel at every level in our organization structure. Document Control: Document control is a very important aspect in our quality assurance. We maintain the database of procedures, forms and work instruction applicable to each department. Receiving inspection logs are maintained into a database before product is received into stock. Any material that does not meet our purchase order requirements is rejected and sends to Materials Review board. Counterfeit Prevention / Risk Mitigation Control: Saitech Inc has a strict policy of procurement from only the manufactures or manufacturers’ authorized channel distributors only. As a policy we do not procure any product directly from China. Our procurement and receiving department has strict processes and procedures in place to prevent for any counterfeit products getting into the supply chain of our customers. We are equipped to provide complete product traceability to the OEM / Manufacturer. There is a rigorous and continuous supplier evaluation and supplier appraisal process in place to ensure high quality standards are maintained. 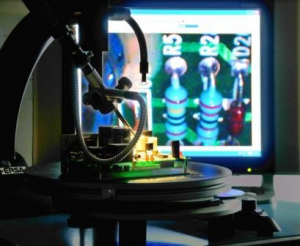 ERAI Membership: By partnering with ERAI we have access to services that monitor, investigate, and re-post issues affecting the global electronics supply chain. We integrate with industry part databases to ensure timely and accurate end-of-life and Quality/counterfeit alerts. Internal Audits: Saitech Inc. regularly conducts internal audits to ensure that the Quality Management system continues to conform to the original plan and is effectively Implemented and maintained. Corrective / Preventive Action: Quality assurance issue corrective and preventive action reports whenever any customer complaint or to address a deficiency and reduce or eliminate it in future. Management Review: Saitech Inc. management has a weekly review to assess Company’s performance and addresses any issues related to product quality or total Customer’s satisfaction. Establish policy and assigns responsibilities necessary to prevent the introduction of counterfeit materiel at any level of our customer’s supply Chain. a. Not knowingly procure counterfeit materiel. c. Document all occurrences of suspect and confirmed counterfeit materiel in the appropriate reporting systems including the Government – Industry Data Exchange Program (GIDEP). DOD / End Customer / User, supply chain as a method to prevent further counterfeiting. e. Investigate, analyze, and assess all cases of suspected counterfeit materiel. f. Debar any suppliers with any history of counterfeit products in their stock or in their supply chain.